All shale gas plays invariably have “core” areas or “sweet spots”, where individual well production is highest and hence the economics are best. Sweet spots are targeted and drilled off early in a play’s lifecycle, leaving lesser quality rock to be drilled as the play matures (requiring higher gas prices to be economic); thus the number of wells required to offset field decline inevitably increases with time. The NDIC issues a Daily Activity Report where they list permits issued as well as wells completed and wells released from the tight hole confidential list. These reports usually, but not always, also give the number of barrels of oil per day and barrels of water per day for the first 24 hours of production. I have gone through every day, back to November 1st, 2013 and collected the data on every well listed that gives production numbers and copied that data to Excel. In that one year and three weeks I have gathered the data from every one of the 2,171 wells that give production numbers. Sorting these wells by well number, which is the original permit number, gives some startling results. To smooth the chart I created a 200 well average of barrels per day per well. The first point on the chart is therefore the average to the 200th well, #23890 and the last point is the 200 well average to the 2171st well, #28971. As you can see there has been a continuous, though erratic, decline in first 24 hour production as the well numbers increase. Breaking this down according to well numbers we see production peaked with the 2400s and have steadily declined since. Every group of well numbers does not contain the same number of wells. The above chart is monthly first 24 hour production per well and first 24 hour percent water per well of all wells that the NDIC listed production numbers. The November 2014 numbers are only through November 21st. Note: The first 24 hours of production is far from being the average first years production. And though all wells are different I am relatively sure there is an average conversion rate but I have no idea what it is. I would guess it is somewhere between one quarter to one third of the first 24 hours of production. But if anyone has any idea what the average conversion factor is, if one exists, please email me at DarwinianOne at Gmail.com, or post it in the comments section of this post. North Dakota issues drilling permits in sequential order. But those permits are not drilled in sequence. Drillers will often sit on a permit for two to three years, renewing then as the law requires. 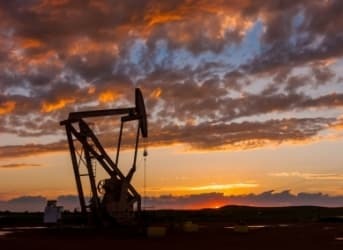 A list of all active drilling rigs, the well number they are working on and the date they started can be found at the NDIC’s Current Active Drilling Rig List They are listed according to their API number but the list can be copied and pasted into Excel and sorted according to your wishes. Of the 191 rigs working, 39 or 20% are working well numbers below 28000. 76 or 40% of rigs are working well numbers in the 28000s. And 76 or 40% are working well numbers in the 29000s. Permit #28000 was issued on March 26. 2014. So 80% of all rigs are working on recently issued permits. As of November 21st, the highest well number completed was #28971. The highest number well currently being drilled is #29908. The highest permit number issued is #30076. “Our entire spectrum of secondary recovery methods don’t work,” Kleinberg said, in a sobering talk at the Energy Information Administration’s annual summit in the nation’s capital. Water flooding — where water can be swept from separate injection and producer wells — isn’t an option because the tight oil formations are too dense to permit those water flows. In conclusion, first 24 hour production per well, when measured by well number, has dropped by 40 percent since peaking in the 24000s. This, to me anyway, clearly indicates that the sweet spots are playing out and companies are now drilling on less productive acreage. I now believe that North Dakota production will peak no later than 2015 with a high probability that 2014 will prove to be the peak year.